The board is similar to ASUS's models supporting 16bit memory - it's clear that the engineers implemented their early technical ideas. At the same time, the PCB is more functional as it provides more space for various controllers because now it's equipped with only two memory slots. The layout is standard - its handling it not very convenient because of a great number of controllers. The audio-ins are in front of PCI slots, IDE Raid are behind them, and the power supply +12 V is tacked in between the CPU connector and AGP slot. It can be difficult to reach jumpers when the board is already installed. Their functions are shown on the textolite. The 2-channel switching voltage regulator incorporates 7 capacitors of 3300 uF and 4 of 1200 uF. IDE Raid on Promise PDC20276 chip supporting Raid levels 0 and 1 on ATA133 protocol. Thanks to the Winbond ITE IT8708F-A I/O controller the board supports (and have connectors) a smart card reader. 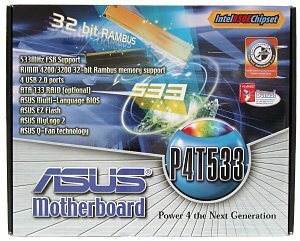 The board incorporates ASUS POST Reporter (reports about problems during booting), ASUS MyLogo2 (for displaying your images when the system boots), ASUS EZ Plug (allows using a power unit which doesn't comply with the ATX 2.03 standard), ASUS Q-Fan (auto fan speed control) and ASUS EZ Flash BIOS (for flashing new BIOS without loading the system from a diskette). +5 V supplied in the StandBy mode is shown by the green LED; the red LED goes on when the memory bus is powered. Non-unsoldered connectors: flash card reader interface controller and the respective connectors; space for PHY controller and RJ45 connector. temperatures of the processor (a built-in sensor), the board (a built-in sensor) and an external sensor connected to the board. 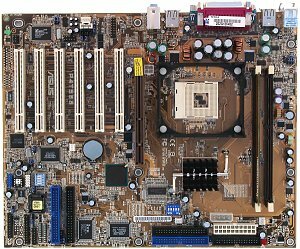 Brief characteristics of the board: memory slots - 2 32bit RIMM RDRAM; expansion slots - AGP/ 5 PCI /CNR; I/O ports - 2 COM/ LPT/ 2 PS/2/ 4 USB 1.1 / 4 USB 2.0; dimensions - 305x245 mm. We used the BIOS 1003 beta 003 as the latest available version. This solution is very rich in functions and performs extremely well. Certainly, it's quite expensive today (because of the new memory type) but it's worth it.